Smoothies and shakes are a great treat that can be enjoyed all year round. Ice cold, healthy and refreshing, Emed’s Super Smoothies and Shakes are an ideal way to get the extra protein, vitamins and minerals you need everyday. Not only do they taste great, but they are actually good for you too. Great for breakfast, as a snack or pre-workout energy boost, these shakes incorporate the best protein powders and formulas available, which also ensuring a yummy treat. 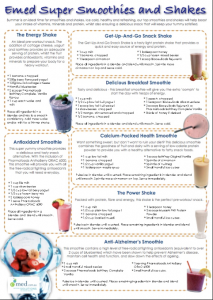 Download and print your free copy of the ‘Emed Super Smoothies and Shakes’ eBook today to share with your friends and family! The Energy Shake is an ideal pre-workout snack. The addition of low fat cottage cheese, yogurt and IsoWhey Complete Shakes provides a comprehensive serving of protein, whilst the inclusion of blueberries adds important antioxidants. Fantastic for preparing your body for a heavy workout. Place all ingredients in a blender and mix to a smooth consistency, Add more water and/or milk for a thinner shake. The Get-Up-And-Go Snack Shake is a tasty light protein shake that provides a quick, easy and delicious source of energy and protein. Aminoplex Clear is included to provide an adequate source of protein, vitamins, minerals and amino acids that will give you the energy to perform at your best all day. Place all ingredients in a blender and blend until smooth. Sprinkle more cinnamon on top and serve cold. Tasty and delicious – this breakfast smoothie will give you the extra ‘oomph’ to start the day with heaps of energy. Packed with fruit, protein, magnesium and calcium, this smoothie is a ideal breakfast replacement for those on the go. Place all ingredients in a blender and blend until smooth. Serve cold. This super yummy smoothie provides a delicious and tasty snack alternative. With the inclusion of Amazonia Raw Prebiotic Grass Fed WPI, this smoothie will provide you with all the free-radical fighting antioxidants that you will need everyday. Crave something sweet, but don’t want to ruin your diet? This delicious smoothie combines the goodness of fruit and calcium with a serving of low-calorie protein powder to provide you with a healthy and satisfying alternative to fatty snack foods. Pulse ice cubes in blender until crushed. Place remaining ingredients in blender and blend until smooth. Sprinkle more cinnamon on top. Serve immediately. Packed with protein, fibre, energy and health benefits, this shake is the perfect pre-workout snack. Providing you with plenty of energy to complete a heavy workout, the Power Shake won’t sit heavy in your stomach, and will ensure that you get 100% from your exercise. Pulse ice in blender until crushed. Place remaining ingredients in blender and blend until smooth. Serve immediately. This smoothie contains a high level of free radical fighting antioxidants (equivalent to over 2 cups of blueberries) which have been shown to prevent Alzheimer’s disease, maintain cell health and function, and slow the effects of ageing.